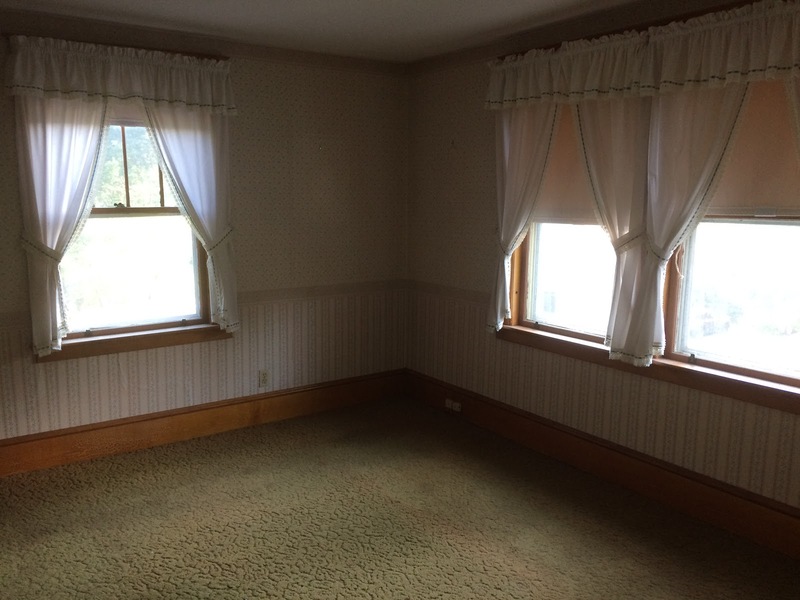 This is not entirely the post I hoped to write about the master bedroom. Sigh. So: as mentioned previously, there is a lot of wallpaper in this house. Eventually, I want it allllll gone. The first room we are doing will be the master bedroom, for two reasons. First, the carpet is disgusting – the pad underneath is so old it crunches when you walk on it. Like you can feel it sort of grind under your heel and it makes this noise like a dying cockroach and also it is this green color that ugh. Second, I would like at least one room to be nice and done and then I can have a nice bedroom and be done with it and move on. We left the master bedroom empty when we moved in, and have been living in the other front guest room for now, which is no hardship at all because it is only a smidge smaller than the master and is right across the hall. 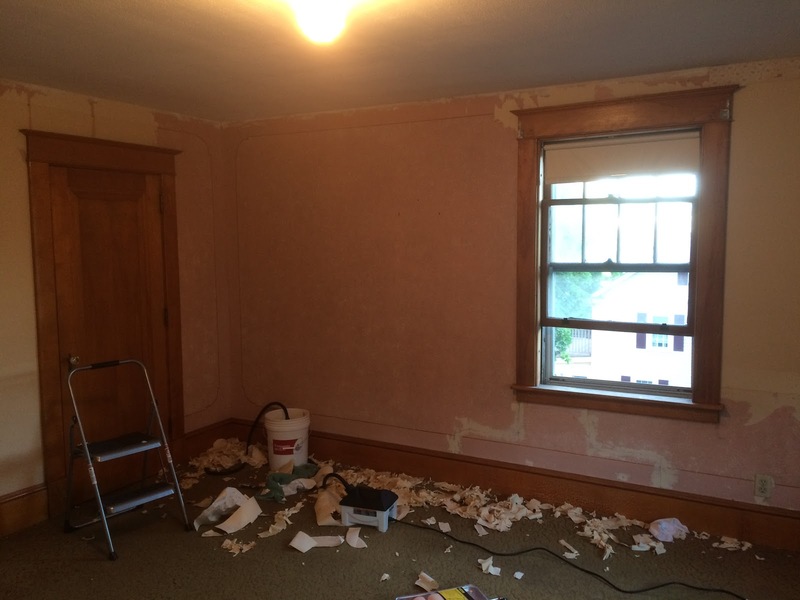 So here is the workflow: remove wallpaper, patch cracks, caulk windows, prime, repaint, pull up carpet, move furniture in, have lovely new bedroom. The top vinyl layer peeled right off with fingernails. No problem at all. Kind of fun to do, actually. The bottom paper layer then steamed right off. Tedious, but simple and straightforward. (Did I mention my in-laws bought me a wallpaper steamer for my birthday? <3) Get it wet, shimmy it off with a putty knife, move on. Total time elapsed: about two days, or say about 10 hours. See, it’s not enough to get the wallpaper off. You have to scrub off an additional layer of wallpaper paste underneath, or, apparently, it traps moisture and in a very short time your pant peels right off and then you are back at square 1. Common wisdom says: most wallpaper paste is wheat-based, so it should dissolve with water, or at the very worst some dish soap, or vinegar. Wipe it off with a sponge, it’ll take a while but it won’t be too hard. I tried: hot water, Dawn, dishwashing soap, vinegar, vinegar + Dawn, vinegar + dishwashing soap, 3 different kinds of “wallpaper paste removal” products. I used a sponge, then a stiffer sponge, then a scrub pad, then a grout brush, then a heavy-duty brush that attached to the end of my cordless drill. I soaked it, left it, soaked it, left it, and tried again. No change. Fiance and I worked hard for 2 hours and got about a four square foot area done. Yeah. I know it’s still there: I can see it, a thin gummy film over the paint. It clings so fiercely that when it is gone, so are the top two layers of paint. I hesitate about sanding it off, because while I have good evidence that the wallpaper was applied in the early 1980s, I have no idea what’s underneath it, and I am being extra-cautious. It may come to that yet. So, back to the internet. I now have a new array of chemicals and will keep spot-testing until I find one that strips this #@!#!%$##@ stuff. Until then…we are stalled in this room, though by no means on the house at large. There’s TONS of other stuff going on & coming up in the next few weeks, including the Big One: rewiring the house from basement to attic. Next Post How do you calculate & pay your board? 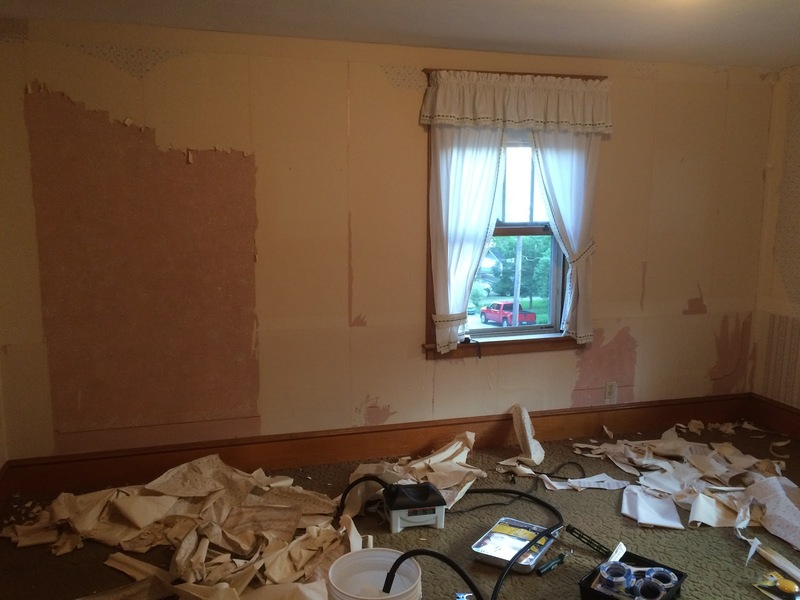 I spent my entire weekend peeling wallpaper so I totally feel your pain. I did half the bathroom, which wasn't so bad, and then decided to start on the bedroom. Bad idea. The bedroom is actually painted over wallpaper on top of plaster on top of unfinished fiberboard. And the plaster is cracking and falling off the walls. We might just put thin drywall over top of the whole thing because there's no good way to get it all off. That will probably screw up door jambs and stuff so I haven't committed to that plan. Yet. But i do feel your pain, I really do. I have not answers to your wallpaper delimina, but I just wanted to say that I love the curtains! I've lived in rentals for so long, which have all had blinds that I forgot how “homey” and cozy they can make a room feel.